Introducing the Maybelline Color show Glitter Mania. it's not just nail polish, it's nail jewellery. All that glitters is precious, indeed.The runway inspired range of colors would help you stand out and make a style statement. The glossy texture looks opaque in a single coat. Choose from 8 vibrant shades. 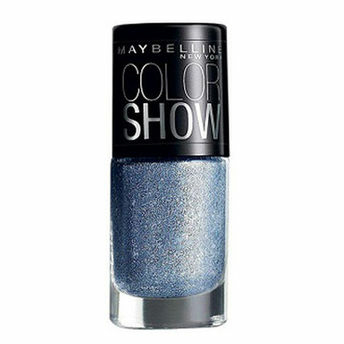 Maybelline Color Show Nail Lacquer would be a great addition to your make up kit. The bold, glittery colors and the creamy texture would make it an instant hit. Quantity. Explore the entire range of Nail Polish available on Nykaa. Shop more Maybelline New York products here.You can browse through the complete world of Maybelline New York Nail Polish .Alternatively, you can also find many more products from the Maybelline New York Color Show Glitter Mania Nail Lacquer range.